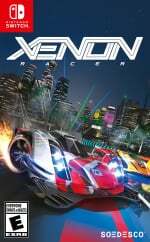 Publisher Soedesco has revealed that its upcoming racing game Xenon Racer will be speeding onto Switch on 26th March. A new trailer has been released to celebrate. The game takes place in the near future, where an official racing federation has allowed teams to transition from the cars we know today to flying vehicles. You'll be putting the pedal to the metal in a championship, with your advanced cars driving at "crazy speeds", drifting and boosting your way to victory. Obvious comparisons can be drawn to the likes of F-Zero, Wipeout, and Fast RMX on Switch. At the time of writing, Soedesco is streaming the game on its Twitch channel to celebrate the release date announcement. You can head to the channel here to give that a watch. Do you love futuristic racers? Will you be getting behind the wheel in this one? Tell us below. looks waay to slow paced to be a "f-zero" like game. Bizarre press release considering it states "...has allowed teams to transition from the cars we know today to flying vehicles" but the video doesn't actually show any flying vehicles! Getting more Ridge Racer vibes than F-Zero. We've had some really good F-Zerolike games but none will fully satisfy that itch because they're not F-Zero. They don't have the same character and tone that elevated F-Zero above all the other high-speed futuristic racers. They're good! Well worth the time, and this looks good too, but not F-Zero. "The game takes place in the near future, where an official racing federation has allowed teams to transition from the cars we know today to flying vehicles"
Erm, they have wheels, even had close up of the wheels at one part of the video, looks a bit like a futuristic Le Mans race, doesn't look very fast at all. The only game that can scratch the F-Zero itch is F-Zero. GX was perfect, they don't have anything to change, just make it HD, then go back to work on that HD remaster of Skyward Sword you are secretly preparing just for me... And potential millions of other fans. A solid effort and I don’t mean any offense, but after watching gameplay this is no where near F-Zero GX, the holy grail of racing games. This is the Cyber Formula GPX game I always wanted. Looks like I will be able to finally retire one of my favourite Gamecube imports. @Shiryu I was about to say. I know that the recent PC Cyber Formula GPX game was a completely different dev team than the GC one, but this trailer reminded me mostly of that, just with higher production values. Looks kind of slow paced compared to F-Zero, and besides the car visual designs, I'm not really seeing anything that matches what I think of when I think 'futuristic racer'. No speed boosting or weapons or flying cars or anything that really matches my expectations. Might be a solid racer. But that looks like that's all it is. And I too vote that Nintendo really, really needs to just do an HD remaster of F-Zero GX. And tweak the story mode difficulty while they're at it. Between all the cars in it and the fact that you could make your own...it was the perfect racing game. The car styling reminds me of the Ridge Racer series. We have gotten a fast F-Zero like game since 3/3/2017 and it's called Fast RMX and it's an amazingly fast quality game. I'll be amazed if the Switch version looks that good. This article should have never compared it to F-Zero. This is more like a futuristic Ridge Racer. That said, the game looks fantastic. @Ogbert I agree. This looks more like a Ridge Racer or Project Gotham type to me. Suffice it to say, it looks great. As much as I love futuristic racers, I've always preferred street racing with loads of drifting involved. F-Zero GX was, and still is, the pinnacle of the genre. But this looks good too. @diablo2 Just be thankful that for once, nL didn't compare something to OutRun. No thanks. I'm good with Fast RMX. Though a Fast sequel (maybe with vehicle customization), or FZero sequel would definitely get my money. Would Love to see someone make another futuristic cycle racer like extreme g.
Yeah the Cars does not have that F-Zero speed feel or F-Zero any feel at all. Looks great will be getting this for sure! 30 or 60 fps for Switch ? I kept waiting for the cars to start riding the walls and knocking each other off-course, but that didn't happen. F-ZERO this ain't. F-Zero?!? This is nothing like F-Zero. This looks more like a futuristic Ridge Racer game. If it's anything like the trailer then yes I may check this out. I was excited, then realized we were looking at PS4 graphics. It's amazing that Switch doesn't have a decent racing game outside of Mario Kart. When I want a good racing game I'm still going back to Need For Speed: Most Wanted U on the WiiU. Oh boy. I'll stick with WipeOut Omega Collection till F-Zero comes out. Time to give up on RedOut for Switch I guess. Down to $8 on PC and home console. Just bring us F-ZERO!!! 16 years now!!! this is a bad trailer to a game wich can be good. I will wait for gameplay videos before formulate a opinion. Yeah, when I saw the comparison to F-Zero I was about to pass over the article as there's already plenty of games like that about, but it doesn't really remind me of F-Zero at all, as, while it may be futuristic, it still seems to be very much set in the real world, which to me, makes it a lot more interesting than I first thought it would be. this actually looks good and could be a fun arcade racer in a futuristic setting. unfortunately people are putting it down already due to the unfair and inaccurate f-zero comparison. hope it reviews well. This looks cool. Gonna be a paired back mess on the Switch, though. Yeah this is an arcade racer akin more to classic Sega racers. it's nothing like F-Zero or trying to be. I wonder if the Switch will support 60fps and if so at what cost. I'll probably get this on another system to be sure. @SakuraHaruka My pleasure. I don't own many Japanese GameCube imports, but he few I do are absolute gems. Okay, had to create an account just to comment on this. Why is every comment about fzero and not this game? It doesn't look like fzero and it doesn't look like it's trying to be. I'm sure the developer's of this game just love reading all these awesome encouraging comments from Nintendo fans. Ask Nintendo where fzero is, not in comment sections about unrelated games. Game looks pretty cool I guess, should be faster though. Will wait for reviews.